"Wine and cheese are ageless companions, like aspirin and aches, or June and moon or good people and noble ventures" M.F.K. Fisher, Vin et Formage. Washington State is not yet necessarily known for cheese. But the culinary landscape of Washington is dotted with well-known and well-anointed cheeses and cheese makers having Washingtonians take pride in their products. It seams only appropriate that the nation's second largest wine producing region, have a handle on cheese as well. 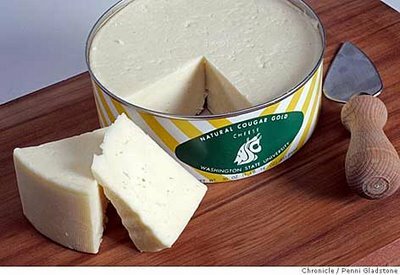 Though there are other notable cheese makers in Washington State, a good EAST vs.WEST rivalry is represented by Cougar Gold and Beecher's. First a few basics about Wine and Cheese, that may just be the dynamic duo of the culinary world. The just go so well together and even though it really comes down to personal taste, certain guidelines have been proven favorable in pairing this iconic food couple. • White wines match best with soft cheeses and stronger flavors. • Red wines match best with hard cheeses and milder flavors. • The more pungent the cheese you choose, the sweeter the wine should be. Similar to to the Apple Cup or any other State rivalry, Washington has outstanding cheese from both sides of the State. EAST: Well, around here, what we really want to know is what pairs best with Cougar Gold®? 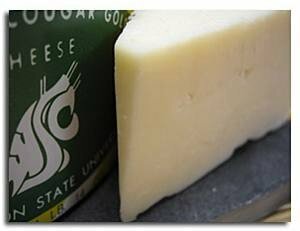 According to the WSU website, sixteen artisan cheese makers and wine producers from the Northwest got together and agreed - Cougar Gold pairs best with Viognier, Savignon Blanc, Pinot Noir and Merlot. 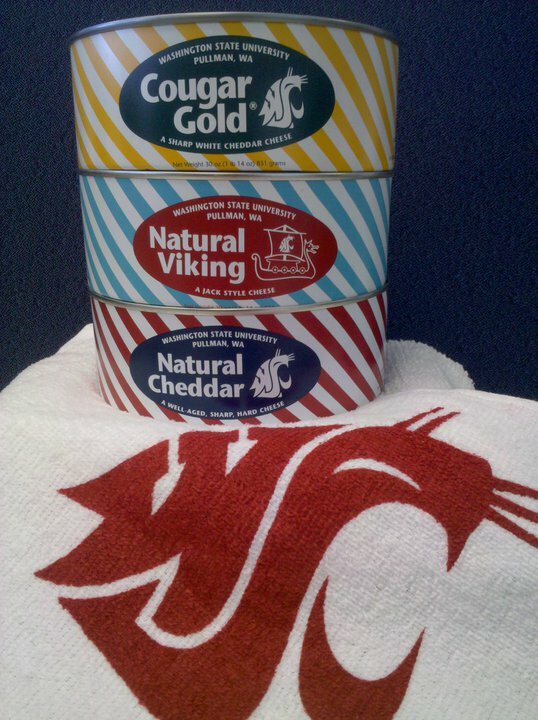 The Pullman Creamery currently produces almost 300,000 cans of cheese each year, 80% of which is Cougar Gold®. Cougar Cheeses come in the following flavors: Cougar Gold®, American Cheddar, Smoky Cheddar, Viking, Dill Garlic, Sweet Basil, Hot Pepper and Crimson Fire. Visit the creamery to see how Cougar Gold® Cheese is made and have a sample and maybe even indulge in an ice cream cone or milkshake at adjacent Ferdinand's Ice Cream Shoppe, which features old-fashioned ice cream and soda fountain treats, exclusive ice cream flavors, gourmet coffee and espresso drinks and of course, award winning Cougar Cheese®. If you have now decided you are headed to Pullman, I suggest you take the opportunity to visit some wineries and even a new brew pub while you're in the Pullman area. Sip Tip: Cougar Gold® cheese is consistently available at area Rosauers and now we're thinking that Viognier, is personally a favorite match. There is a significant savings for buying it at the factory in Pullman ($18 versus $25) Local Viogniers are Barili, Townshend, Overbluff "Vixen", and Coeur d'Alene Cellars. WEST: Beecher's is an oh-so tasty artisan cheese maker located in Seattle's famed Pike Place Market. I believe the market is one of the nation’s culinary landmarks and not to be missed when visiting the Seattle area. Though this is always a good choice for a bite, Beecher's is especially perfect on a grey Seattle day, because this may be the ultimate in comfort food, as well as, one of the best homemade cheeses EVER. It has a smoother texture than your conventional cheddar. Slightly sweet, salty and delightfully nutty and sharp, it is well on its way to becoming a classic. Perfectly toasted grilled cheese sandwiches, creamy tomato soup, and to-die-for grown up macaroni and cheese are all found on a busy corner in the heart the Market. Write off lunch as educational as Beecher's milk jug bar stools face an observation area for cheese making. I suggest you order up, grab a stool and watch the cheese makers slowly create bliss in an open vat. The best news for out of towners is Beecher's ship their delectable Flagship Cheese and that World's Best Mac 'n Cheese anywhere in the country. This superbly Seattle eating experience won't disappoint and will have you thinking about how soon you can get back there or if you should just place and order to meet you back home. 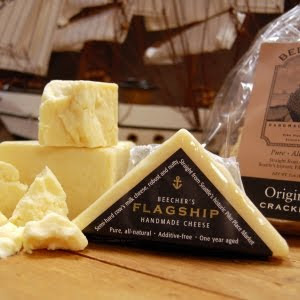 Beecher's cheese varieties include their famed Flagship, Jamaican flavored No Woman, creamy Just Jack, Madagascar Marco Polo as well as, Smoked Flagship. Sip Tip: Medium and Full bodied Reds work well with sharper more flavorful cheeses such Beecher's Flagship cheese. I recommend a Merlot from either Liberty Lake Wine Cellars or Latah Creek Wine Cellars. I also felt Syrah was a good match and suggest Syrahs from Arbor Crest Wine Cellars or Merry Cellars. There are Cheese 101: Introduction to Artisan Cheese classes which include sampling and wine pairings is offered at their Bennett's Pure Food Bistro on Mercer Island. As always, it's your palette that counts, so having your own tasting is the best way to pair food and wine. Around here in the Inland Northwest, Beecher's can be found at Huckleberries, The Rocket Market and occasionally at Safeway and Yokes. Beecher's Handmade Cheese is at 1600 Pike Place Seattle, Washington 98101 206.956.1964 and recently opened a store in Manhattan. Who wins in the Washington State cheese bowl? Melt the butter in a heavy-bottom saucepan over medium heat and whisk in the flour. Continue whisking and cooking for 2 minutes. Slowly add the milk, whisking constantly. Cook until the sauce thickens, about 10 minutes, stirring frequently. Remove from the heat. Add the cheese, salt, chile powder and garlic powder. Stir until the cheese is melted and all ingredients are incorporated, about 3 minutes. Use immediately, or refrigerate for up to three days. Wine Pairing: Beacher's suggusts Syrah with their Flagship cheese. I do know about that with the Mac & Cheese. There is some cheddar and Jack in it, so I think Zin. Beer Pairings: India Pale Ale; Hefweisen - perfect. 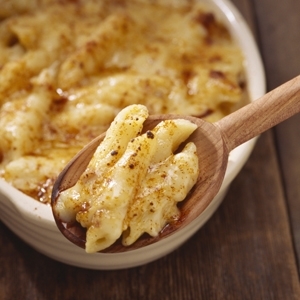 Cougar Gold® elevates this timeless comfort food to a new level! Preheat oven to 350°F and grease a 1 ½ quart baking dish. Bring the water, salt and pasta to a rolling boil in a medium saucepan. Cook just until tender. Drain pasta, put into prepared baking dish and set aside. Meanwhile prepare the sauce. In a saucepan over medium-low heat, melt 2 tablespoons of butter. While whisking, gradually add the flour. Whisk for about 2 minutes or until golden and bubbling. Very slowly add the milk, whisking constantly to avoid developing lumps. Simmer for 15 minutes until thickened, stirring often to prevent mixture from burning. Remove from heat and stir in Cougar Gold® and black pepper to taste. Pour sauce onto cooked pasta (do not stir). Melt 1 tablespoon butter and toss with breadcrumbs. Sprinkle on top of casserole and bake for 30 minutes or until the crumbs are golden.